Bishop John Pessima (right) of Sierra Leone Conference reports that the Ebola crisis has crippled the economy and basic food prices have soared. Offerings have been taken locally, and rice has been purchased and distributed among UB churches. But their resources are limited. Bishop Pessima has traveled regularly among churches to encourage and pray for pastors and members. He is particularly concerned about our nine churches in Liberia whom they have not been able to visit or help. United Brethren churches and individuals have already generously provided thousands of dollars to help with the Ebola crisis in Sierra Leone. However, the crisis is far from over, and may indeed become much worse. As you examine health insurance plans for your church staff, you might want to consider two plans offered through the United Brethren Association for Church Development, based at Rhodes Grove Camp in Chambersburg, Pa. This is our denomination’s voluntary insurance program. About 50 UB people, including the staff of the US national office in Indiana, are enrolled in the plan. The UB Association offers two programs with Capital Blue Cross of Pennsylvania. The policies are effective December 1, 2014 through December 1, 2015. A pallet of food being loaded onto a truck at Cochranton Community Church, for shipment to Sierra Leone. United Brethren pastors Joe Abu (Philadelphia, Pa.) and Michael Mudge (Cumberland, Md.) worked with a cluster of UB churches in Maryland, West Virginia, Virginia, and Pennsylvania to fill a 20-foot container with medical supplies and equipment. The churches secured donations, purchased items, and raised all but $2000 of the $8000 needed to send the shipment. The additional $2000 was provided from generous gifts sent to Global Ministries. Another container with food items donated by UBs is now on its way to Sierra Leone through the organization Brother’s Brother, and we funded a second container filled with medical supplies for sierra Leone. Global Ministries learned that the Brother’s Brother was sending a 40-foot container of medical and relief supplies to Sierra Leone (in 2010, Brother’s Brother provided 76 hospital beds to Mattru Hospital). They had room for one pallet of food items and offered it to us, but we had to get the pallet to Pittsburgh within two weeks. Pastor Steve Clulow and his folks at Cochranton UB church (Cochranton, Pa.) offered to receive all donated food and prepare the pallet. With the help of Dave Staples, a church member who owns a shipping supplies company, they delivered the pallet in time. A Baptist group paid the $11,000 needed to send that container; other containers were funded by other denominations. 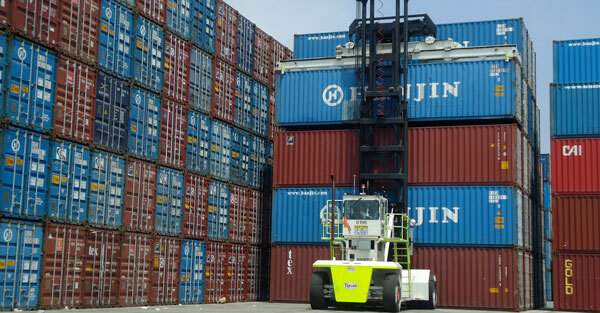 We agreed to underwrite the next container, and once again UB donors stepped forward. When Brother’s Brother told us they had the next container packed with nearly $400,000 of medical supplies, we were able to send a check for $11,000 that same day and commit to covering the clearing fees once the container arrived in Freetown. John Pessima, bishop of Sierra Leone Conference, was contacted by Dr. Ladipoh, a Sierra Leonean who studied medicine in Germany. 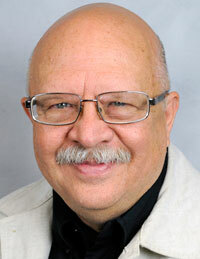 Dr. Ladipoh is board chairman of the UB church in Berlin, which includes many immigrants from Sierra Leone. Dr. Ladipah is also vice chairman of Bintumani, an organization in Germany that has provided countless supplies to Mattru Hospital over the years. He and members of the Berlin United Brethren church sent 14 cartons of Ebola equipment and supplies for the hospital. Everything arrived in early November. 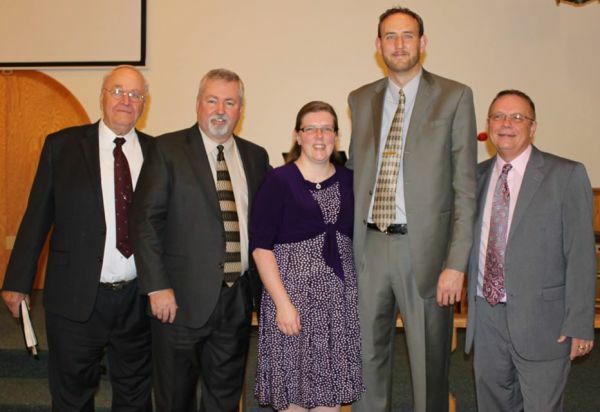 L-r: Roger Overmyer, Bishop Phil Whipple, Amanda and Steve Henry, and Gary Small. Bishop Phil Whipple conducting the ordination service. 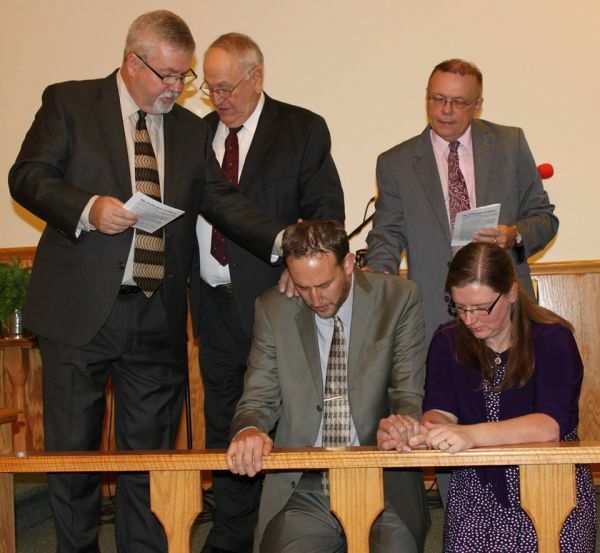 Steve Henry, pastor of Victory Heights UB church (Franklin, Pa.), was ordained on Sunday, November 23. Bishop Phil Whipple conducted the ordination service, assisted by former pastor Roger Overmyer and Gary Small, pastor of the Atlantic Avenue UB church in Franklin. Steve Henry has been pastor of Victory Heights since 2006. Dr. Paul Michelson plans to retire from Huntington University in May 2015. He has been a history professor at HU since 1974. When he retires next year, it’ll be 41 years, one of the longest tenures of any professor in the school’s history. “I’m going to be 70,” he said. “I think that’s probably a good time to call it a day. …. I’m still in reasonable condition. I need to get my book done before I turn completely senile.” He has written or co-edited six books. This will be his seventh. In addition to his service at Huntington University, Dr. Michelson was a member of College Park UB church in Huntington and served 12 years on the denomination’s Executive Leadership Team, 1993-2005. Michelson earned his Ph.D. from Indiana University, and considered positions at Taylor and LeTourneau universities before choosing HU. For more about Dr. Michelson, read this article published in the student newspaper, the Huntingtoninan. Do you know someone who enjoys working with a small church body, teaching informal classes to build relationships, and has a heart for evangelism and discipleship? Jen Blandin, part of the Global Ministries staff in Macau, will be on a scheduled home ministry assignment from March–August 2015. We are praying for the right person to substitute for her during all or most of that period. This person will work with the Living Stone UB church in Macau and with another missionary to impact this city of over 500,000 people. Despite over 200 years of Protestant missions, Macau is still only 1.6% evangelical. Pray with us that the right person will be found for this temporary position, and ask that God will turn the Gambling Capital of the World to Himself! Brian Reynolds speaking to pastors of UB churches in Ontario. Pastors from the United Brethren Church in Canada are on a retreat this weekend in Stratford, Ontario. Guest speaker Brian F. Reynolds is challenging the group of 12 pastors to ask themselves, “What Do You Expect?” The topic, also the title of Reynolds’ book, focuses on expectations in ministry–how to manage them and work with those who have their own expectations. Jeff Bleijerveld, Global Ministries director, is participating this week and will be providing an update on our shared missions efforts. Global Ministries is the international arm of the United Brethren in Christ in Canada and the United States. In addition to the oversight Canada provides for our ministry in Haiti, they have also taken on 50% of the support for Brian and Rachel Glunts. The Glunts, along with their three children, are preparing to join our ministry in Thailand. Mabel Mundy (left) and Judy Dyer. 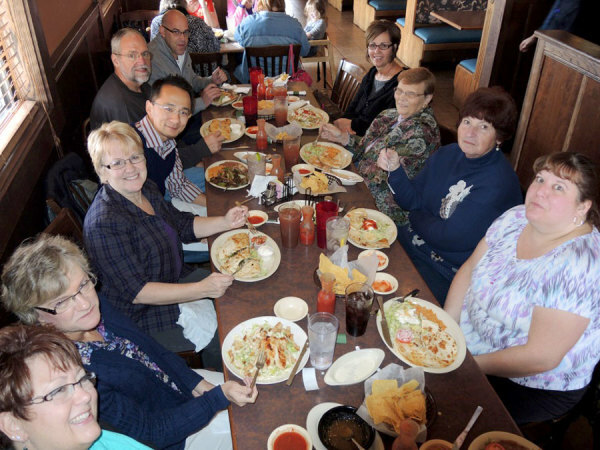 The National Office staff took Mabel out to a local Mexican restaurant for a farewell meal. The UB National Office welcomes Judy Dyer to the staff. 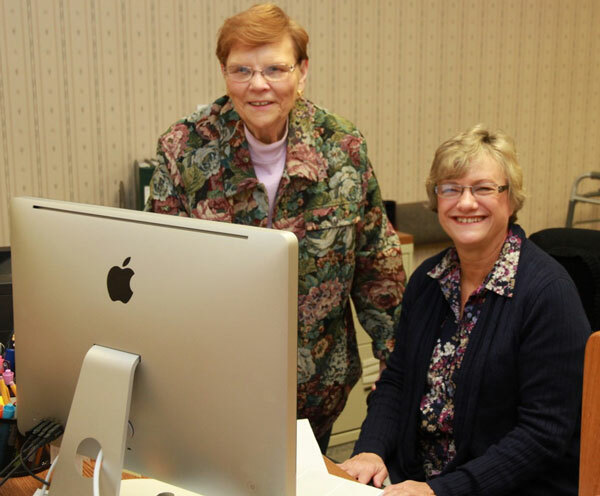 At the beginning of November, she began work as the new accounting clerk. She will work closely with Finance Director Marci Hammel. Judy grew up in Huntington and has lived here all her life. She graduated from Huntington University in 1976 with an associates degree in Business Management and Administration. In 2002, she received a Bachelor’s degree in Accounting from Indiana Wesleyan University. Judy takes the place of Mabel Mundy, who had served at the national office since 1987. At age 74, she decided it was time to retire. She and her husband, Bill, live outside of Huntington. For 16 years, she was executive secretary in Global Ministries, and worked for three different persons—Bishop Jerry Datema (until 1993), Global Ministries director Kyle McQuillen (1993-2001), and then Global Ministries director Gary Dilley (2001-2003). In June 2003, Mabel switched to a different role, as accounting clerk. We are grateful for Mabel’s 27 years of service in the national office. She was extremely dedicated, tireless, selfless, and just a very very nice person to be around. Earlier this week, a very impressive young couple visited the UB National Office in Huntington, Ind. They are preparing for missionary service in an “undisclosed” (as we say) country on the other side of the world, where they will train church leaders to be more effective in their work. The husband is the son of a former United Brethren pastor. As a staff, we laid hands on them and prayed for them. Global Ministries supports a number of such missionaries, and some are doing fascinating work for the Lord. But, frustratingly, we can’t tell you about them. However, you can still pray for these unnamed persons who minister in potentially hostile situations. God knows who they are.